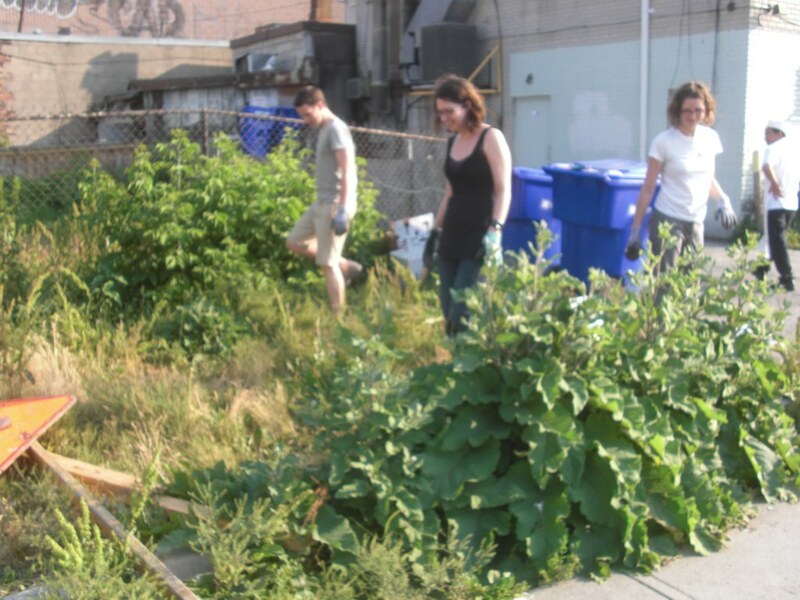 The Guerrilla Gardeners are a group that gardens abandoned land in cities. Despite its legal ambiguity, the group has had pretty good relations with the City of Toronto. 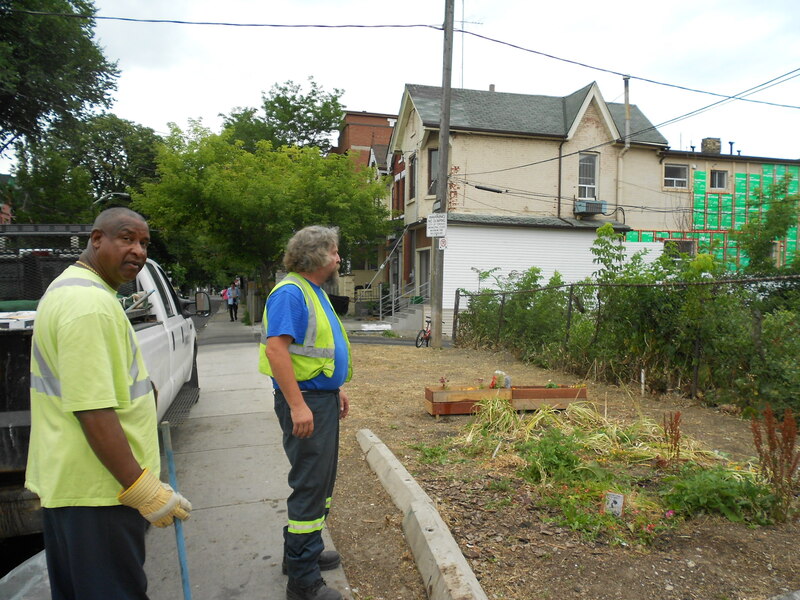 And it has continued in the last week: I’d like to share a story of cooperation between City of Toronto employees and Guerrilla Gardeners. There’s a particularly nasty plot of abandoned land near hacklab. It’s been that way for the three years I’ve known of it, and people in the neighborhood say its been that way for over ten years! It’s hard to convey just how bad this site was. People were using it as a dump, leaving everything from panes of glass, and doors, to bags of garbage and piles of… excrement. In the weeks leading up to the planting, Eric planted sunflowers and I went over every few days to water them and get rid of weeds. I missed the actual planting because I was in Europe, but they did an amazing job of turning a segment of the plot into a garden. You can see Eric’s post on it here. Another group turned some of the garbage into a tiny hut, though it collapsed shortly there after. Since I got back, I’ve been watering the garden every morning and evening (the amount of water I can transport is limited and the land dries out very fast). 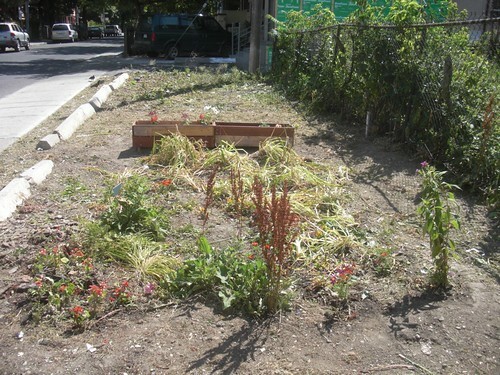 A few days ago we had a pleasant surprise: someone had gotten rid of all the garbage and cut down all the weeds around our garden! They also got rid of the sunflowers along the fence, but it was a big improvement. The super-nice guys that cleaned up the lot! In any case, I think we should make the rest of the plot into a garden. With the weeds gone, it should be a lot easier. Personally, I really want to get some lilacs in there! This entry was posted on July 19, 2011 at 02:55 and is filed under Uncategorized. You can follow any responses to this entry through the RSS 2.0 feed. You can leave a response, or trackback from your own site.